Product #20468 | SKU 1SKB-R3S | 0.0 (no ratings yet) Thanks for your rating! 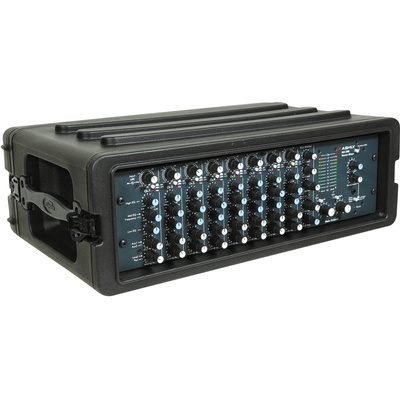 The black 3U Roto Shallow Rack Case with Steel Rails from SKB is a rotationally-moulded shallow rack case with multiple applications, including holding equipment such as computers or music players which are "rack-able" or which can be screwed into the case. This case has steel front and rear threaded rails with a rail-to-rail depth of 27.2 cm and three vertical rack units. There is a water-resistant gasket in the lid and a side grip handle.